2011 Beach2Battleship Half IM - Eat. Train. Compete. It started out as a cold day. And then got colder. By 8:30am it was a blissful 50 degrees F with NW winds of 30mph. The benefit of the swim in B2B is that the current is wonderfully fast. I actually may have worked too hard against the current considering my swim time. I will blame it on the fact that I haven't swam in open water in awhile. I felt like I had to look up to site on every stroke so that I didn't get whisked away past the buoy to turn into the swim finish. By the time I I got to the swim exit ladder, my hands were numb and my arms felt like lead pipes. It was worse getting out of the water though. My arms were cold in the water, but my entire body was cold when I got out. 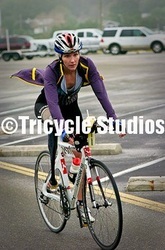 I changed my shirt completely before the bike, having learned from the last time I did this race. 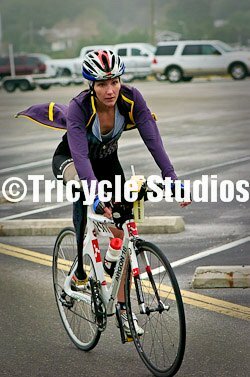 The bike was cold 3 years ago when I did the full IM and it warmed up to 70 degrees that day. We would not be so lucky this day. The bike was cold as expected. It started to drizzle around mile 10 and the winds started to pick up. In addition to a constant 30mph wind, there were also gusts of 35-50mph. I barely ate during the first half because I was convinced that if I stopped peddling with full effort, my bike would come to a screeching halt and I would fall over. So I just grit my teeth and kept my legs spinning. Luckily at about mile 35 we turned one last time and it seemed as if there was a small tailwind. 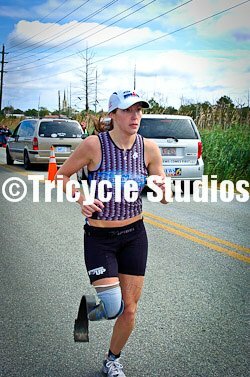 There still seemed to be a headwind too (the wind seemed to be coming from every direction), but it was not quite as forceful and I was able to settle into a comfortable 20 mph pace that took me back into the transition zone. 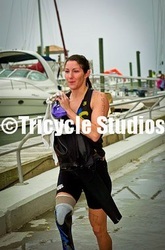 I was thrilled to Lisa at the bike dismount line holding my running leg and liner. She readily took my bike gear (bless her soul) and I was off on the run, never knowing that my boyfriend who had started 15 min after me was right on my tail. The run started out much the same as the bike. Cold and winding. I turned up the first bridge straight into a headwind that almost knocked me over. I actually had to lean forward and drive my shoulder into the wind as I slowly ascended the bridge towards the 1 mile marker. And that pretty much describes 50% of that run. There were a few miles in the middle that actually felt pretty good. I finally took in enough calories to perk up a little and was able to settle into a comfortable pace that carried me to mile 10 without too much trouble. Miles 10-12 were a dark time for me that day, but I kept mustering up the will to take one more step into the wind. The last mile actually had a tailwind though I was almost completely out of energy by then. Luckily I passed a woman walking up the last bridge who recognized me from Survivor. She picked up her pace and started to trudge up the rest of the hill with me. Then she got a second wind and kicked it into the next gear, which made me kick it in too. And the rest is history.